In July 2016, the Department for Education published a new Standard for Teachers’ Professional Development for all schools in England. The Standard sets out a clear description of what effective continuing professional development (or CPD) looks like for teachers. To make good practice happen, action must be taken by school leaders, from teachers and from external providers or experts. Only when all three stakeholders act in concert will the CPD have long-term, positive impact on students’ learning. The document is intended to be used to improve understanding, to develop effective and long-term plans and to hold other stakeholders to account for their role in the process. It should be something which all staff in your school are aware of and which anyone with responsibility for leading aspects of CPD should use and discuss regularly. This should include middle leaders, training facilitators, all senior leaders and governors. Back in early 2015, Nicky Morgan and David Laws commissioned the production of a new Standard in recognition that teachers need and deserve high quality development throughout their careers. After the election, Nick Gibb picked up the baton and strongly supported the development of this work. The Standard was finally released at the end of the summer term of 2016. The document was put together by an independent group of experts – teachers, school leaders, school business managers and researchers with a wide range of experience – chaired by Teacher Development Trust CEO, David Weston. They began by reviewing existing advice and standards from across the world and across different professions. They undertook a large scale consultation with hundreds of individuals and organisations from across the sector and sought out the highest quality research on what types of professional development seem to make the biggest different to teachers’ and students’ learning. The Standard describes 5 key headline ideas. In the Standard, there is an expectation that individual professional development activities (e.g. one-off sessions, individual meetings, etc.) are threaded together in a logical way to create programmes which have an explicit focus on improving outcomes for students. Evidence suggests, for example, that a one-day course as a stand-alone activity without a specific focus is unlikely to have a lasting impact on student outcomes. That same course, however, could be used to much greater effect as part of a sustained, coherent programme which includes structured, collaborative in-school activities for teachers to refine ideas and embed approaches. A professional development programme is likely to involve many activities designed to sustain and embed practice, including, but not limited to: individual and collaborative teacher activity; well-designed formative assessment and evaluation; whole-school leadership; and expert input. For example, while an individual session may be a briefing on ‘improving feedback’, the whole programme might be focused on ‘improving vocabulary of pupil-premium-eligible students in Key Stage 3’ and involve plenty of opportunity for teachers to work together both in and out of their classrooms to apply the feedback ideas to this specific focus area. This ensures that all teachers are clear on the intended impact of their learning and can constantly evaluate the effectiveness of any new ideas as they apply them to a specific goal. The Standard therefore represents a sharp move away from programmes that attempt to generically improving teaching through ‘one size fits all’ briefing sessions. The document instead draws on a strong body of research to show that teachers must have access to training which is more directly relevant to students and classes they teach, with more subject-specific content. Effective professional development for teachers is a core part of securing effective teaching. It cannot exist in isolation, rather it requires a pervasive culture of scholarship with a shared commitment for teachers to support one another to develop so that students benefit from the highest quality teaching. The thousands of professional decisions that must be made every day need to be informed by the best evidence, knowledge and professional wisdom. Not all professional development is equally effective. Helping teachers to improve their practice takes thought, planning and effort. It requires headteachers and senior leadership teams who prioritise not only the operational aspects of teacher development but also, as Ofsted put it in their September 2015 handbook, “a motivated, respected and effective teaching staff” in “a culture that enables students and staff to excel”. While professional development can take many forms, the best available research shows that the most effective professional development practices share similar characteristics. Effective professional development should be seen as a key driver not only of staff development, but also of recruitment, retention, wellbeing, and school improvement. This new Standard certainly raises the bar in terms of the quality of practice expected in every school. It identifies how the most effective leaders and schools are creating self-improving schools that generate sustainable, long-term improvements for staff and students. There is no doubt that leading, resourcing and championing professional development has always been a significant challenge. With schools finding themselves under increased budget pressure this has become even more difficult. However, the approach laid out in the Standard offers a route map for improving student outcomes, staff retention, culture and wellbeing in a very sustainable way. For this reason, the most successful schools are protecting or even expanding their professional development budget, time and leadership even in the face of reductions elsewhere. Not only is this a decision driven by fundamental values that prioritise professionalism and learning, this decision also looks sensible even through a cold value-for-money lens. When recruitment is tough and academic expectations are rising, governors and leaders realise that they need to move funding away from sticking-plaster interventions and into sustained support and development for their most expensive assets, the teachers and other staff who work with students every day. 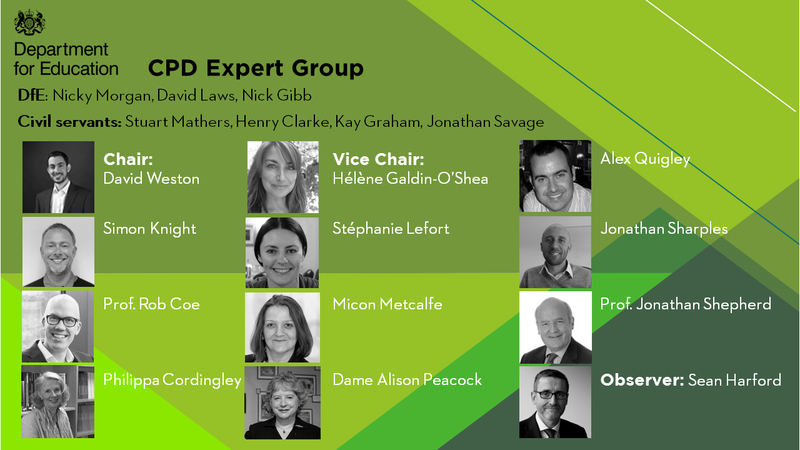 To browse the full portfolio of documentation around the Standard for Professional Development, you can find it on the DfE site here.